Nutz4Nutrition: Drink Water. How much? Not long ago a health story was shared with me and I would like to share this story with you. In sharing our stories is how we all learn and connect. A young women, in good health and spirits shared her story with me. She told of her many visits to various physicians, family practice, neurologist, internal medicine, etc. looking for the cause and treatment of migraine headaches which had debilitated her to the extent she was unable to work when the headaches were present. After exhausting the medical experts in her city, missed numerous days of work and unable to care for her children she traveled to Mayo Clinic as a last hope. In just a few days the physicians at Mayo Clinic diagnosed her with dehydration, the cause of her migraine headaches. She was given IV fluid therapy for 48 hours and sent home with a prescription for drinking more water. This is how she concluded her story "I spent thousands of dollars to find the cause for my migraine headaches and all I needed to do was drink more water." All body functions depend on water. Our health depends on the critical balance of all systems. When even just one system fails us, we become lost on the road of degenerative illness. A road that is sometimes difficult to find our way back, always long, and expensive emotionally, physically and economically. 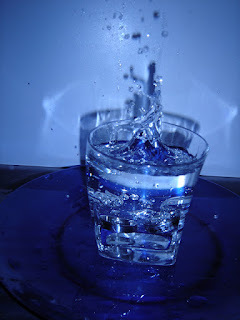 Lately there have been a small number of articles in the news, discussing "over-hydration" or drinking too much water. This occurs in a very small portion of the population, the rest of us ... needless to say needs to drink more to support our body's healthy body functioning. The Institute of Medicine advises that men consume roughly 3 liters (about 13 cups) of total beverages a day and women consume 2.2 liters (about 9 cups) of total beverages a day. Another approach, is take your body weight, divide that number by 1/2, this would leave the total number of ounces you will drink. For example, if you weight 100 pounds divide 100 by 1/2 = 50. Your water intake requirement will be 50 ounces per day. Which ever approach you use, consider this ... if you drink enough fluid so that you rarely feel thirsty and produce 1.5 liters (6.3 cups) or more of colorless or slightly yellow urine a day, your fluid intake is probably adequate. Other considerations when deciding to how much water to drink. Coffee and soft drink drinkers (caffeine load) need to double your water consumption; exercise enthusiasts add 8 ounces for every 20 minutes of exercise to replace the water you loose with these dehydrating activities. than it is to cure disease.